Simpson, Michael John and Michelle Filice. "History of Powwows". The Canadian Encyclopedia, 10 April 2019, Historica Canada. https://www.thecanadianencyclopedia.ca/en/article/history-of-powwows. Accessed 24 April 2019. There are various stories about the powwow’s origins. Some credit the Poncas with holding the first inter-tribal powwow in the early 1800s. 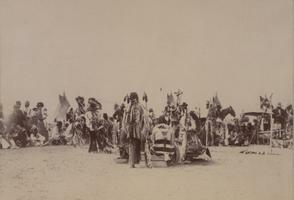 Others claim that the Northern Plains First Nations created powwow dances during the 19th century. While the exact origin of the powwow is unknown, these celebrations were adopted and adapted by various Indigenous communities across North America throughout the 20th century. Today, powwows are cultural exchanges that are used as part of healing ceremonies, and to celebrate Indigenous dance, music, food and art. The word powwow most likely stems from an Anglicization of pau wau or pa wa, from the Algonquian language family of southeastern Canada and the northeastern United States. Most scholars believe that powwow was derived from the Narragansett words pau wau, which translated into English as “he or she dreams,” it initially referred to the healers within the tribes of the East, who often interpreted dreams as a part of their role within the community (see Shaman). Others claim powwow comes from the Pawnee word pa wa, meaning “to eat,” which may indicate a reference to any large gathering of people for purpose of celebration or commemoration of an event. During the 1800s, the term powwow was appropriated by folk healers of European origin. While travelling through North America, selling their herbal remedies, the folk healers showcased Indigenous styles of dancing in tandem with the folk healing. This, according to ethnomusicologist Tara Browner, resulted in powwows becoming associated with “Indian dancing.” Since then, the First Nations of North America have re-appropriated this word to mean a primarily secular event which features intertribal singing and dancing (see Powwow Music; Powwow Dances). With the introduction of reserves in the 1830s, First Nations in both Canada and the US attempted to resist cultural assimilation by maintaining a connection to Indigenous traditions through dance and music. The reserves created an environment where secular, intertribal songs and dances quickly evolved. The traditional music and dance of the Indigenous peoples of the Great Plains — like the wacipi of the Lakota and the niimiwin of the Anishinaabe — became some of the main templates for these adaptations. The new styles of song and dance developed in the Great Plains and the Great Lakes regions, and remain popular in the Canadian Prairies (Alberta, Saskatchewan and Manitoba) and the northern United States, primarily in the Dakotas. In Canada, First Nations protested the Indian Act by organizing political forums and petitioning Ottawa, as well as the Canadian courts, for the re-establishment of their spiritual practices. Some First Nations also tried adapting their ceremonies to make them less “threatening” to the federal government. For example, some communities shortened powwow celebrations, while others agreed not to consume sacrificial foods or give away gifts during their festivals. Plains Cree Chief Peyasiw-awasis (also known as Kapitikow or Thunderchild) and various elders of the Treaty 6 and 4 lands argued that their right to perform traditional dances, music and festivals was enshrined in their treaties. After hearing their petitions, the federal government decided in 1911 to clarify Section 114 of the Indian Act, thereby allowing more First Nations in these areas to openly celebrate powwows. However, the 1914 Indian Act still prohibited powwows and other cultural ceremonies in some parts of Canada. Despite government restrictions, First Nations in both Canada and the US continued to hold powwows, and other cultural and spiritual ceremonies, in secret. In Canada, some Indian agents chose to turn a blind eye to such festivals, as long as they did not attract much attention off reserve. The Standing Buffalo Dakota Nation and Thunderchild First Nation in Saskatchewan continued to hold powwows for 75 years during the restrictive period.Today, some powwow organizers still make reference to and honour these two nations. The persistence of powwow dances and Indigenous ceremonies throughout this period demonstrates the strength and ability of First Nations to survive and adapt. After the Second World War, many returning Indigenous veterans demanded freedom of religion and the right to practice traditional ceremonies. Indigenous communities also became more vocal about their marginal position in society throughout the 1940s. Between 1946 and 1948, Parliament established a Special Joint Committee of the Senate and House of Commons to hear various reports on Indigenous life. Although the Joint Commission recommended continuing a policy of assimilation for Indigenous peoples, it also suggested reducing the overt oppression contained in the Indian Act. The result was another amendment to the Act in 1951 that allowed First Nations to continue their traditional ceremonies, including powwows, without interference by federal agents. However, some Indigenous peoples argued that the amendment came too late. By the 1950s, years of assimilationist policies and institutions — including residential schools — significantly curtailed and outright restricted the ceremonial life of First Nations. Some First Nations children were ashamed to participate in powwows, while some elders were too frightened, still fearing possible consequences from the federal government. As a result, several traditions and ceremonies were lost or altered. However, powwows endured, and only became stronger in the decades to come. In light of Indigenous rights movements and efforts to reclaim Indigenous culture in the 1960s, the powwow tradition entered an era of resurgence. Indeed, during the 1960s, powwows became extremely popular summer events at reserves. Some less-financially stable First Nations relied on assistance from the broader Indigenous community, and, in some cases, even from certain non-Indigenous peoples, to host powwows at venues outside the reserve. Cross-cultural exchanges at powwows allowed for people from different Indigenous and ethnic backgrounds to come together in a celebration of song and dance. The modern powwow was born. Contemporary powwows can be private, intra-national events, where only members of a particular First Nations community are invited, or they can be public gatherings where anyone and everyone is invited. Modern powwows can also be defined as traditional or competitive. Traditional powwows are held in local communities, and do not have dance and drum group competitions. Competitive powwows have dance categories for women, men and children. Dancers are judged based on their footwork and regalia. Individuals who score the highest in their category receive awards or cash prizes (see Powwow Dances). Modern powwows also provide food, craft and clothing vendors with the opportunity to sell and share their handiwork with the community. Many of these professional craftspeople, dancers, musicians and singers earn a living from the contest powwows. From the 1800s to the present, powwows have stood as a testament against assimilationist polices and institutions. Powwow dancers and musicians who refused to abandon their cultural traditions resisted colonial and racially discriminatory legislation, both on and off reserves. 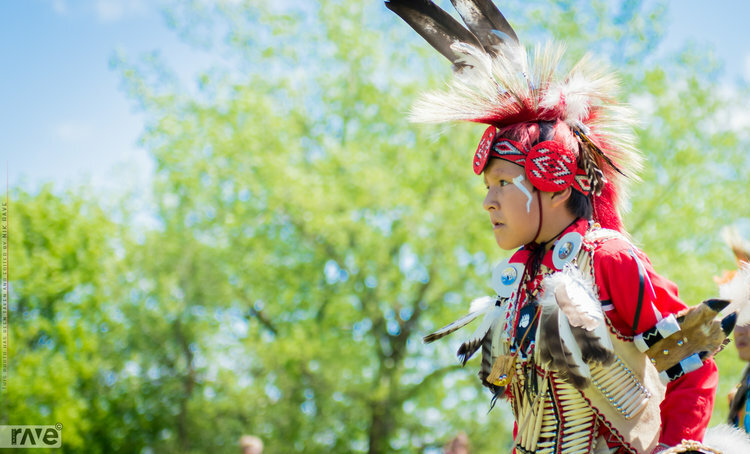 Today, powwows are a place where both Indigenous and non-Indigenous peoples can come together in peace to celebrate tradition and promote an enduring culture. A.M. Aurand & J.G. Hohman. Powwow Book (2003). Tara Browner. Heartbeat of the People: Music and Dance of the Northern Powwow (2004). Charlotte Heth, ed, Native American Dance: Ceremonies and Traditions (1992).